Two strap 6" design for lower-profile wrist injury support. The Form Fit 6" Wrist Brace with patented Form Fit 3-dimensional molding technology allows us to vary padding thickness in strategic locations for superior comfort and fit. An optional gel insert is available to provide hot/cold with activity. The two strap design is the lowest profile design in the Ossur lineup of supports. The Ossur Form Fit wrist brace 6" is extremely breathable and provides comfort and support for a wide range of soft tissue injuries needing immobilization. The shorter length is ideally suited for shorter height individuals 5''7" and less. Ergonomically contoured variable padding for greater comfort..
Removable/adjustable palmar stay for adjustable support. Breathable Lycra liner for breathability and comfort. Two adjustable hook and loop contact closures for adjustability. V-notch design at fifth M.P. allows for palmar spread and full use of fingers. Sculpted, narrow web space prevents pinching and irritation. Optional gel pad (See Related Product) insert provides hot/cold; Removable & therapeutically beneficial. Available in four sizes - please see our sizing chart tab above for important measurement guidelines. Mild to severe soft tissue injuries. 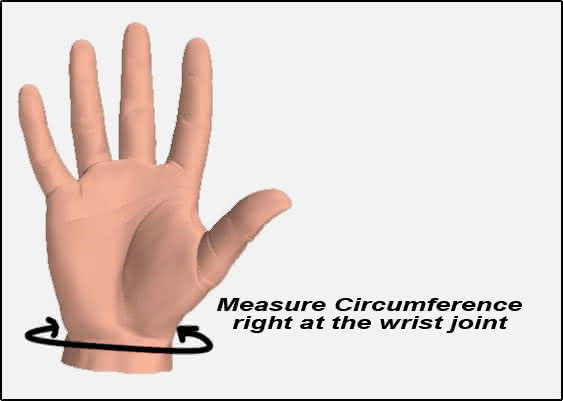 Sizing Chart: Measure wrist circumference for sizing below and specify right or left. Durable, lightweight outer material lined with Lycra on the inside for breathability. This is the second time that I bought this Ossur Form Fit wrist brace 6". For me it's working wonderfully; help me a lot with the pain in my wrists. Most of the time I use them at night when I go to sleep. The Form-Fit 6" is shorter than my typical wrist brace and since I'm only 5'2" this was perfect for me. Good comfort and was easy to apply. Q&A for Ossur Form Fit Wrist Brace 6"